In keeping with this philosophy, over the past few years I’ve experimented with various techniques and ingredients, with varying degrees of success. I won’t mention the worst failures, but the Aussie sushi (ham, cheese and tomato) was certainly memorable. On the more successful end of the scale, I like to use the savoury tuna or salmon that comes in flavours like Penang Curry or Thai Chilli (for the non-vegetarians), and sushi omelette also proves very popular. It helps a lot to have a (square) sushi omelette pan. 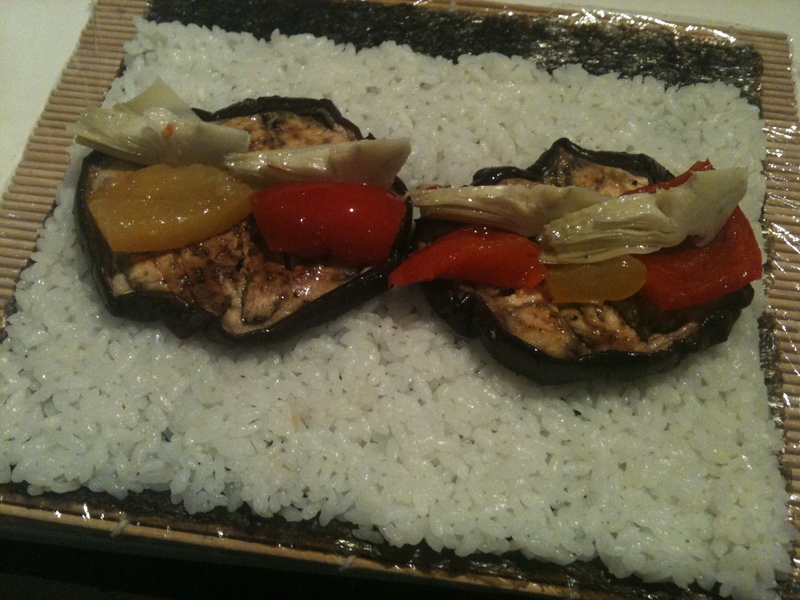 Recently I made gourmet pizzas and had some left-over ingredients – grilled eggplant, capsicum and artichoke hearts – and thought these might be interesting in sushi. They proved to be a major hit. I made a couple of maki-zushi (large hand rolls) with these ingredients, and they disappeared very quickly. So I present: Antipasto Sushi. This entry was posted on Monday, September 6th, 2010 at 9:37 pm	and is filed under Personal. You can follow any responses to this entry through the RSS 2.0 feed. Both comments and pings are currently closed.